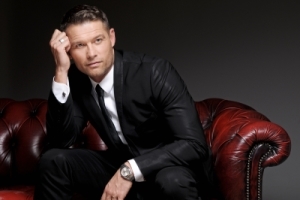 At the time of the interview, John Partridge was appearing as Zach in A Chorus Line at the London Palladium. John trained at the Bush Davies School of Theatre Arts and Doreen Bird College of Performing Arts. He left college to join the cast of the original UK tour of Andrew Lloyd Webber’s musical CATS and subsequently portrayed the role of Rum Tum Tugger in the official film production of CATS. 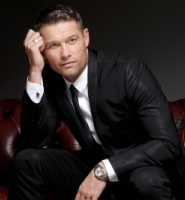 John has worked extensively as a singer and dancer in musical theatre, and has also appeared in various television programmes, including BBC’s EastEnders. Earlier this week John chatted about his career and A Chorus Line. I hope you enjoy what he had to say. You are probably best known for having played the role of Christian Clarke in EastEnders. What did you enjoy most about the role and being a part of this nationally popular show? I feel honoured that I have made a small contribution to a programme as iconic as EastEnders that is a part of television history. I was very proud of the character Christian and everything that we achieved with the storyline in making some small headway into breaking down the taboos regarding homosexuality. It was very difficult to be able to tell a gay story like Christian and Syed within a timeframe around 7.30pm, and before the 9 o’clock watershed. But this was something that we were able to do quite successfully, and also make the characters successful within that. I am extremely proud of being a part of that. I learnt so much from being on EastEnders, especially from the directors and the writers. Acting in television is a very specific genre which I had no experience in and people were very patient with me. I feel that I am a much better actor now. A lot of people may knock continual drama saying there are “shaky sets” or “terrible acting”, and that is just completely untrue and unfair. I am using all of the skills that I learnt at the BBC in my time in EastEnders here in this particular production at the Palladium. Had I not had the opportunity to work on EastEnders I would not be doing this show now. You have appeared on numerous television programmes including hosting them. If you could choose one TV show as being your number one favourite which one would it be and why? I loved being on BBC’s Over The Rainbow. I enjoyed the opportunity of being able to pass on what experience and knowledge that I had, to people that were just starting out on their career. It was extremely rewarding to be a part of that programme and it is even better now to see the finalists who went on to drama school now graduating. To think the work that we did on that show helped produce these young ladies who will go out and hopefully have full and varied theatrical careers is brilliant. I have kept in contact with all of them, and thinking that I may have helped in some small way feels great. You joined the original UK tour of Andrew Lloyd Webber’s musical CATS and went on to play Rum Tum Tugger in the West End. What did performing in CATS mean to your career? It meant everything to my career. It is where I grew up as an actor. You learn the basics at drama school but you don’t really learn about the business until you start working. I was very young and had no real concept as to what it was like working in the West End, or on tour, or being a part of a show like CATS. I really did my growing up in CATS. It is a very personal show to me as it is the only show that my father saw me perform in, as he passed away shortly after I went into the show. The people around me were very important at that time, including the resident director, Gillian Lynne, Chrissie Cartwright and Trevor Nunn who became my family, and they took it upon themselves to look after me at that time in my life. When we opened here with A Chorus Line, Gillian, Chrissie and Trevor were here as my personal guests because they feel like they are my family. CATS is a very personal show to me, it is my favourite show that I have the fondest memories of. It was a unique experience that I will never have again through a set of circumstances that were quite tragic, but it was a wonderful life-affirming, life-changing experience for me. In 2003 you played the part of Marilyn in Taboo. Taboo is currently having a successful run as a live show at the Brixton Clubhouse. What was special for you about being a part of the musical and the storyline? I am quite lucky really in that parts seem to come to me organically in a time in my life when I am ready for them or not. When I went into Taboo, my personal life and my professional life were not very stable. I think in some ways that is what attracted me to that type of role. It is not the type of role I would have ever have played had it not been for my ‘life imitating art’. It was quite a tempestuous and turbulent time in my life and I enjoyed the show immensely because the material was so great. Personally I was not in a very good place at that time and I was only with the show for twelve weeks for that reason, so I have mixed feelings about my time in the show. When I think back on it now, it was one of those parts that came along at a time in my life, in some ways to teach me a lesson, but I enjoyed the show immensely. The music and the book were so strong, and it isn’t often that you get both so strong together. You have joined the cast of A Chorus Line at the London Palladium, which opened on 19th February. What do you enjoy most about being in the show? It feels like a re-birth for me and it feels like I have come home. It feels like everything I have learnt in my career has brought me to where I am now and I am able to use that in my role in the show. I am not so old that I don’t remember what it is like to be seventeen, straight out of school thinking yeah I can do this and looking around the room thinking you are all so old and I am young. But I also know what it is like to be 33-34 and still auditioning for those same parts that you were auditioning for 20 years ago, and not getting them. I have been on both sides of the fence, and then I had a break and moved to the other side of the line. Every night here at the London Palladium it feels like coming to church as A Chorus Line has a resonant story with anybody that has an aspiration to be an actor. This isn’t just about putting on a show. Bob and Baayork have been very particular about creating an ethos. This is their life. We feel like we are caretakers of the show, and don’t feel any ownership of it. When we come here every night we take the utmost care to make sure that each performance is delivered with truthfulness and honesty, and I think that is something that is quite unique within this type of theatrical environment. I feel that this role is a once in a lifetime opportunity and won’t come around again. If I hadn’t had the time on television with EastEnders I may not even be playing this role. It has really been a chain of events that has led me to this part, and I am very appreciative of that and at the same time very humbled by it. It isn’t all about being serious as there is nothing more exhilarating than being on the stage shouting 5,6,7,8 and launching into that routine. It feels exhilarating and exhausting at the same time. It has been the most amazing experience and this is definitely one for the book! You play the role of Zach – what can you tell us about your character? Zach is many things and is not an easy character to play. He could become a dismembered voice and have no colour. Zach is very complicated, on the one hand he is very strong and unsympathetic and yet on the other side of him he understands all of the feelings and the rejections. He is a very complex character to play. What I try to show is what I call my “7 shades of Zach”, showing all of the different aspects of his character. He is charismatic, manipulative, honest and a liar and all of those things. He is many things to many people and most of all to himself. Your partner Jon is also a part of the cast. How does it feel to be working together on the same show? It is fantastic. We have been together for ten years and been married for two. We have had such opposing schedules for the past seven years, passing like ships in the night. And now to be on the same schedule with each other is just brilliant. I know it wouldn’t suit a lot of people but for us it is great. Having not been on stage for some time I felt very comforted having my life partner here with me giving me moral support. You have a Jack Russell called Tilly. How do you make time for her in your busy schedule? Tilly comes to the dressing room at the London Palladium with me. She chases the mice away and also relaxes with me. She is part of our lives wherever we are. In April 2013, you perform a new live one-man show Dames ‘n’ Dudes at the Matcham Room, Hippodrome, London. What can you tell us about the show? It is my thirtieth year in the business and this is really about me being my own boss. Finally I am able to do my own show and my way. It is a bit like the soundtrack to my life. I sing everything from Bowie to Bush, and from Sinatra to Streisand. When I was a 6 to 7-year-old my inspirations were people like Gene Kelly and Kate Bush. That is the type of music I would listen to at home. So the show is about celebrating that and acknowledging all of the people that have helped me along the way including those that I have listened to and been inspired by. It really is my own show and my own way. Do you have a dream role you would love to play one day? No I don’t, because I never really look too far ahead. If you have aspirations like that then I feel you are setting yourself up to fail. I have never been one of those people that have a five year plan. I am very much the type of person that lives right here and right now in the moment. If you spend your time regretting or wishing, then you aren’t enjoying the ‘here and now’ and I don’t want that. I have always lived my life that way and it seems to have served me pretty well up until now. So I don’t really have any aspirations to play anything other than the role I am playing right now. Why should everyone come along to see A Chorus Line? Because it is a piece of musical theatre history. It is not going to be here again for any time soon. It has taken more than 35 years to come back here to the West End. It is an iconic piece of work together with the most famous theatre in the world, and that is an explosive combination. The Palladium has an energy entirely of its own. It really is a once in a lifetime opportunity to see this show and if you miss it now you won’t be seeing it again. Have you any message to those who follow your career? Thank you for being interested and thank you for all of your support. I receive lovely messages of support and have met many lovely people at the stage door. If I have one message in particular to say it is that at the moment I feel inspired in a way that I probably haven’t done for quite a long time. This year has been about new beginnings and fresh starts in a lot of ways and that energy has given me a new drive to achieve. The future may not be in performing as I am now looking into producing as it is something I have wanted to do for a long time, and I have a couple of projects we are in negotiations with at the moment. So in the future you may not see me so much acting as producing. Many thanks John for a fabulous interview. Best wishes for A Chorus Line and your future success!